Before you begin: Decide which Topper style you want to use. Topper panels come in two (2) styles, Pocket or Grommet. The Pocket style can create 3 different header options. Click here to learn more about different Header options. Once you have chosen your Topper style and color, determine the length of your drapery panel. All panels (Topper and Extension) are 24″ in length. Including the Topper panel, determine how many Extension panels are needed to complete the drapery length. Once you know how many Extension panels you will need, decide on the colors you want to order. Choose your Topper panel style (Pocket or Grommet), and select the color. Our Topper panels are 50” W x 24” L and sold in sets of two (2) for each side window panel. Select the color of your first Extension. This will make your total length 48". Extension panels are 50” W x 24” L and sold in sets of two (2) for each side window panel. Select the color of your second Extension. This will make your total length 72". If you need a total length of 96", then choose your fourth Extension color. If you do not need any additional Extensions, select "No Third Extension". If you need a total length of 120", then choose your fourth Extension color. If you do not need any additional Extensions, select "No Fourth Extension". 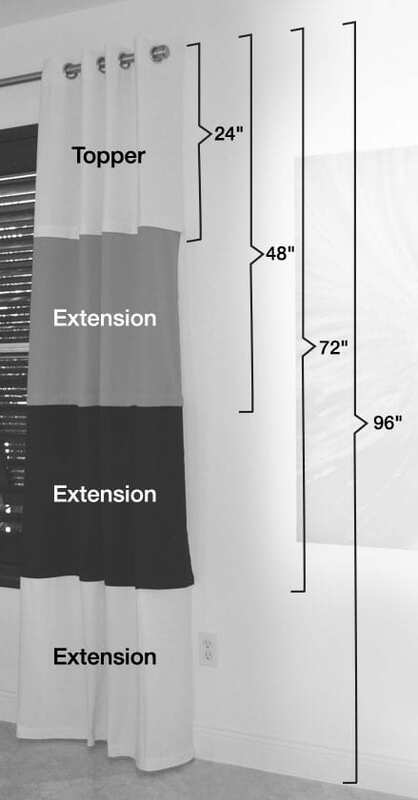 If you need a total length of 144", then choose your fourth Extension color. If you do not need any additional Extensions, select "No Fifth Extension".